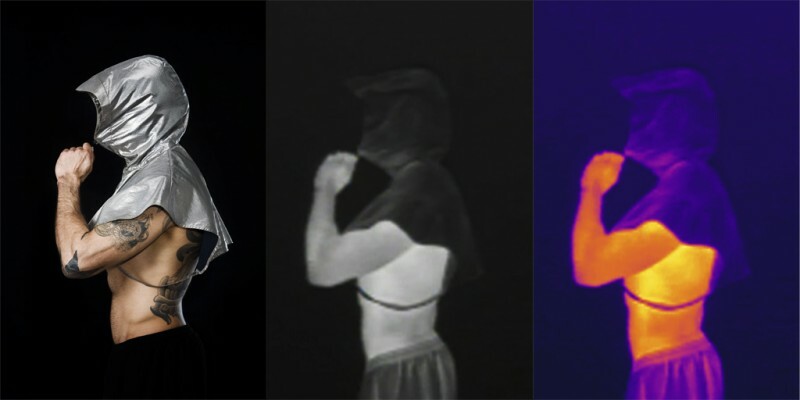 A New York-based artist aware of the current controversy over military-style surveillance aerial drones used on U.S. civilians has fought back with a unique invention: thermal cloaking hoodies made from metalized material used to counter the infrared cameras that spy drones use to spot people on the ground. The artist, Adam Harvey, 31, also offers accessories with his ‘fashionably paranoid’ line of clothing: a surveillance busting cell-phone carry pouch, as well as a shirt that blocks X-rays over the heart just in case the Feds want to take-you-out so to speak. While drone technology is controversial in the United States, it remains a truth that thermal imaging infrared camera(s) are the main sensing tool on-board the drones. Currently, based on a landmark Freedom of Information lawsuit by the Electronic Frontier Foundation last year, they forced federal authorities to reveal there are at least 63 active drone sites in 20 U.S. states. Harvey originally created his clothing line as conceptual art, but with great interest from the public items are now currently on sale. These clothing pieces won’t be cheap though, due to the expensive metallic materials involved a hoodie cost aprox. $1000, while a burqa (only covers the upper body) is closer to $3000. Harvey states ‘Military technology is coming home from the war.’ This rings true due to the fact that Lumistar has been converting military high-tech technology for industrial use for years. Fortunately, even if a person covered themselves from head-to-toe with this high-tech material our smart cameras used for security and surveillance would still detect intruder movement due to sensitivity in contrast. Rest assured the bad guys can’t use drone-busting technology such as this to their advantage from ground (terrestrial) based camera sensors. On the other hand, in terms of aerial drones, as their cameras are spread out far range, this hoodie could potentially be effective in that scenario. Happy drone dodging. Coming to an ‘Arab Spring’ near you. If Obama had a son… he’d be wearing a hoodie. How’s this for going to the beach? I mean in terms of sun protection, then I *might* consider. Multi-use clothing is the new black. These are all the rage in Paris. On second thought, didn’t they outlaw the head scarf? I guess the head-hoodie isn’t too far behind. I need a stealth life. Excellent! I must subscribe the RSS. not in finding your e-mail subscription link or newsletter service. Juѕt wish to sаy your аrtiсle is аs astounding. аnd іcan assume yοu’re an еxρeгt on thіs ѕubjeсt. tо grab your feed tо keep upԁаted with forthcoming poѕt. κeep up the reωarding ωοгk. I need to to thank you for this great read!! I definitely loved every bit of it.